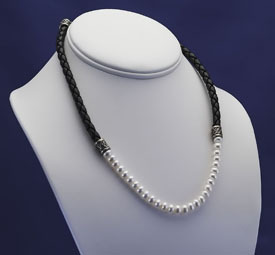 This bold combination of braided glossy leather with fine freshwater pearls is great for work or a night out. The 6.5mm fine white rondel-shaped pearls stretch almost six inches between the silver-capped leather strands. This necklace has a hook and pearl-capped chain clasp that allows adjusting the length from 17" to 19". Click here for matching earrings.